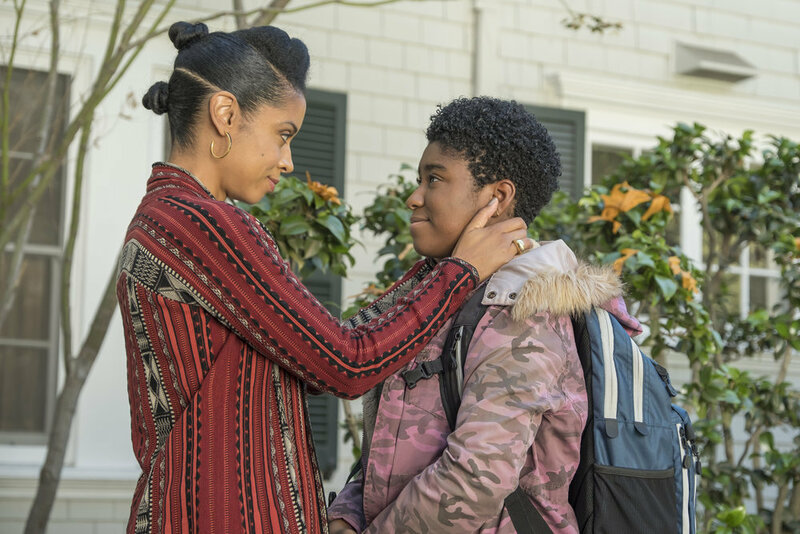 Home > Articles > THIS IS US Sneak Peek: Is Deja Back to Stay? This is Us is back, post Jack Pearson’s Superbowl death, with a somewhat less dramatic entry this week. For most of us, the big take away from the last couple of episodes had to be the surprising manner of Jack’s death, and the emotional fallout of its immediate aftermath. However, there was also that intriguing final moment in “Super Bowl Sunday” in which we learned that Jordan, the adorable little boy in foster care in an Essex County social worker’s office, was not destined to become Randall and Beth’s next family member, but was actually part of a clever flash forward featuring a grown Tess Pearson, and a much older Randall. The moment was a bitter sweet one for fans who were suddenly left wondering if Randall’s fostering dreams might now remain forever thwarted, only to have the rug pulled out a second time by the appearance of former foster child Deja turning up at the Pearson’s front door. Is Deja back to stay? And what crisis prompted her arrival at such a late hour? While we can’t answer the former question just yet, this exclusive new sneak peek clip from Tuesday’s episode does at least provide some answers for curious fans. It looks like big hearted Randall might have to hold onto those dreams a little longer. Meanwhile, the episode will also see Toby and Kate heading to Las Vegas for their respective bachelor/bachelorette parties, while in the past, Jack and Rebecca celebrate their anniversary. The “Vegas Baby” episode of This is Us airs Tuesday, February 27/2018 (09:00PM – 10:01PM) on NBC. Catch the clip, along with a collection of just-released episodic stills, below. Follow us on our official Twitter @ScreenSpy for more exclusive This is Us scoop this season.